Håkan has always been interested in nature and adventures, so the step to becoming a professional photographer was not long. - I was always in the forest when I was a kid; taking photos of the nature and wildlife was a natural part of that life. 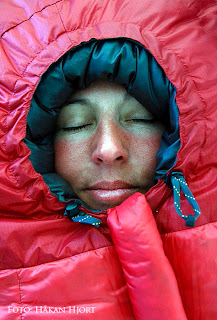 In 1995 I started my company, Niac Photo, and began to document different expeditions as well as travels. Today I’m one of the most frequently hired adventure photographers in Sweden. Also Annika spent most of her childhood in the forest around the village where she grew up, exploring as a kid and training as a youth, becoming an acomplished competition cross country skier. When she met Håkan she quit her job as a teacher in order to work together with Håkan as a freelance writer. Since they are doing mostly adventure articles for different magazines or documenting expeditions, often but not always in the Arctic, this means they are not being restricted to a single area or country. The world is their working place. This kind of work also means that they have to carry all of the equipment by themselves. During tough expeditions it’s important to minimize the weight as much as possibly but still have the best functionality available. That’s one of the reasons they look for light weight gear. Håkan spends much time searching for the right, light and still reliable equipment and testing it as well. 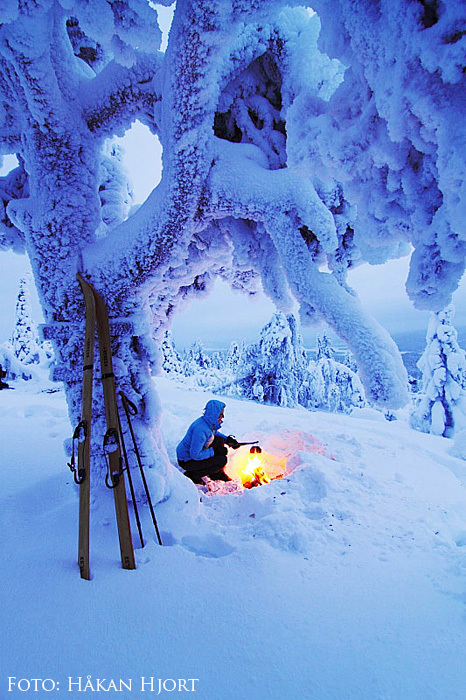 Jorgen: Living as you two do, underneath the Arctic Circle, you have lots of opportunities to do winter camping, both on the tundra and in the taiga. For people planning on doing this, what is most important to consider? In case of an emergency the most important thing is that you have the means to cook! If you are stuck way out in the wilderness in the cold, you can often manage to find shelter even in a broken tent and when it comes to clothing you can always put everything you brough with you on. But if you can’t thaw snow to drink and preferably cook some food you will not last long enough to get either rescued or fight your way back on your own steam. In the forest you are less exposed to this danger than on the tundra, since you can build a fire. However, building a fire in deep snow, at -30 C when everthing is covered with frost and snow takes quite a bit of experience. In winter we use white gas stoves since it works best in sub zero temperatures and some days it can be -30 C or colder. Jorgen: Are you using much lighter gear for winter camping today than you did, say 10 years ago? If so, what are the most important differences? Annika and Hakan: Of course we do, since the technical progress has made gear lighter, but also smaller, which enable you to use a smaller pack and move easier while travelling on snow. Most important however, is that the equipment has become more functional and will better withstand rough and cold weather. If you want specifics we would say that everything with down in it today is much better than ten years ago. The fabrics are lighter and the down has higher fillpower (+800) and is less sensitive to moisture today. Another thing that has become a lot better are wool baselayers. We only use wool these days, both for first and second layer. For temperatures down to minus 20-25 C we use Golite Adrenaline sleeping bags. They are rated for minus 18 C, but can handle minus 20 C without problems. If we expect extreme cold, minus 25-40 C we use synthetic-fill bags from Marmot and TNF. They are twice the weight and bulk of the down bags but will handle 40 below. So far the best tents for winter that we have used are Mountain Equipment Dragonfly 2 or 3XT. Incredibly wind resistant, easy to pitch in high winds, decent space and height, vents well and are not all that heavy. However, they could be improved; you have do be able to close the vents from inside to keep spindrift out. We have made this modification ourselves, it might be that the new editions from ME have this. Jorgen: You are users of both skis and snowshoes, what are the pros and cons of these in different situations? Annika and Hakan: First of all, skis are faster on almost all kinds of snow and you don’t have to work as hard since they float and glide better than snowshoes. But when the terrain is very hilly with steep ups and downs or a forest with a lot of rocks it’s often easier to get around on snowshoes. But for long expeditions with tent, in mountains or forest, we never use snowshoes, they are just for dayhikes. You basically need different skis for the taiga and the mountains. I the forest the snow is "always" deep and soft, you need skis with lots of flotation. The traditional wooden Tegnäs skis in the photo are 2250 mm long and 95 mm wide, they are much better in loose snow than mountain touring skis like Asnes and others. Jorgen: Tell us about a night out in winter that you will never forget! 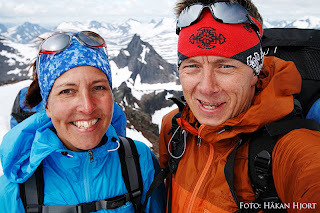 Annika and Hakan: We guess you want us to say something about a disaster :-) Sorry, that has never happened ot us, but there was one night in Sarek National Park when the wind had been hard and during the night we also got a ton load of wet snow. Hakan woke up from time to time and pushed at the tent ceiling so the snow would slide off. When we got up in the morning we had gotten so much snow that what had been forced off the tent roof almost reached to the top of the tent anyway. Imagine what that could have done to the tent if we had not pushed it off the top of the tent.! Jorgen. Thank you, Hakan and Annika. And if anyone of our readers want to look at more of Hakans photos you'll find a ton of them at http://www.niac-photo.se/. Great article, Jorgen! Always interesting to read about different people and their gear / techniques. I have to say that at least this year in the forest the snow was so fluffy I would have benefitted from longer, wider skis.